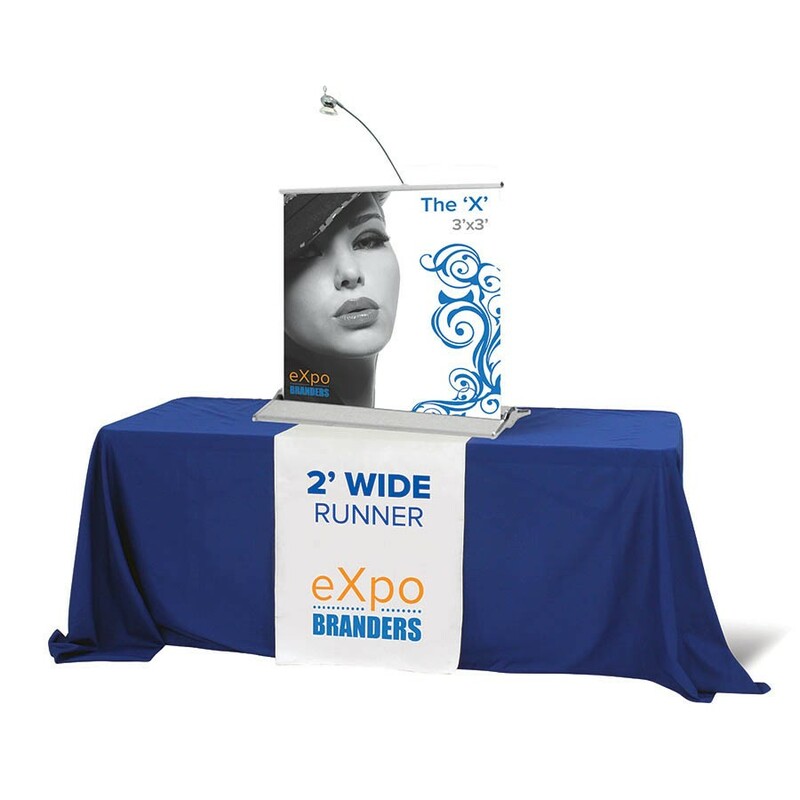 Our table covers are popular for trade shows because they give a table a professional look with little effort. All corners are rounded so the fabric won't gather and drag on the floor. Explore our large variety of options below and give us a call at (571) 299-6908 with any questions. Our eXpo eXperts are waiting to answer your questions! 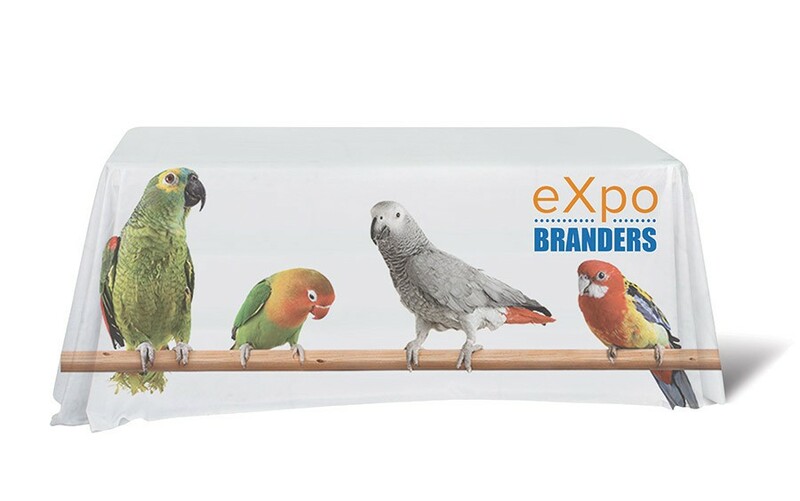 This vibrant cover prints in full color on all sides for maximum impact of advertising space. This fitted cover is snug on the table and avoids excess fabric. The stretchy material lets the cover fit very snug on the table. An affordable option for those on a budget. Adding a runner will give a personal and professional touch to the provided hotel table skirt. All these table throws look the same, so what's the difference? The difference between a polyester twill and standard full color table throw: The imprinted polyester twill covers print your logo on the front. When an item is fully printed all over the throw, it is our dye sublimated option. We offer table coverings in standard throws (skirts), fitted throws, stretch throws and table runners. The difference between a fitted and stretch fitted table throw: A fitted throw is just that - fitted. It is sewn to perfectly fit the table size you request, offering a very polished look without the large price tag. A stretch fitted table throw is made from a stretch poly material and “shrinks” tightly over the table. Some like to call this our “scuba suit” table cover. The difference between a table runner and all the other table throws: A table runner is a strip of fabric that runs front to back over the table. 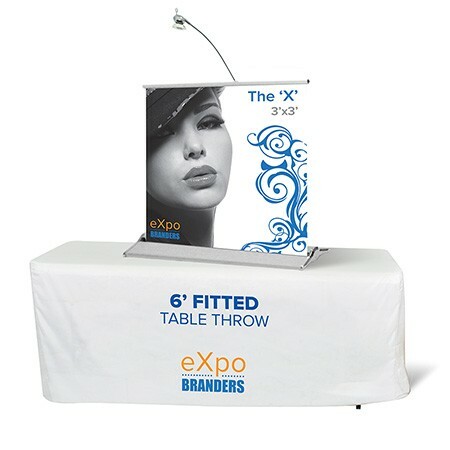 Your logo is printed in full color, or all over the throw, to grab attention at any size event. 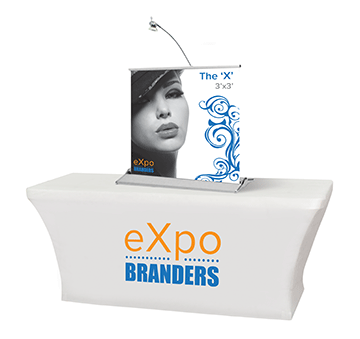 Order a accent colored blank table throw for underneath to really bring our your brand!